Last week, Prometheus (2012) opened which is a prequel to the best alien monster movie ever made: Alien. Or is it? Do you have a favorite alien monster movie? Is it a creature like the shape shifter from John Carpenter's The Thing or the Predator like in...Predator? Would it be from a classic film like The Blob or the Pod People? Let us know in the comments. Next week, I'll update the post with the alien monster movie voted for the most and your best comments. On a side note, I think I may have influenced the voting by using Khan. Hopefully, using a picture of the xenomorph from Alien doesn't influence the voting. Although it is awesome. What's your favorite alien monster movie? Poll: Who's Your Favorite 'Star Trek' Movie Villain? The aliens from "Aliens" are pretty badass with the acid blood and whatnot but the Predator from "Predator" has a nuclear bomb so that's really a tough call. My favorite is the new one...Prometheus, just because there are so many unanswered questions and it provides a depth to the story that goes beyond "badass kills human and then goes onto next human." 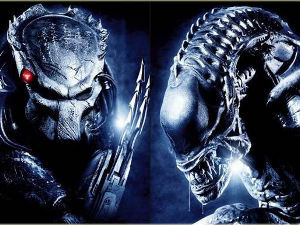 If it's between the aliens from Aliens and the ones from Predators, I would rather go for the Predators, mainly because of all the cool tech. Truthfully though, I find both species quite loathsome, which is why I am voting for Alf. Remember him? The aliens and/or humans in District 9. Nuke versus acid PT. It's a tough one. Prometheus gets a top vote Michael. Who knew? Good one Tony. Both are good and evil in that film. Cameron's Aliens! No one does a movie like him and it was the ultimate roller coaster ride. One alien - scary. Hundreds - terrifying! i am going with the alien from the twilight zone tv show... how to serve man... second which has been mentioned... aliens. Good one Jeremy. It's a cook book! Great point Alex. The hordes of aliens was terrifying.